One of the things I saw at Peapods Cookies and loved was the Neon and Bright Colors- Tea Party Decorated Cookies- Teapots, cupcakes, teacups and flowers! My daughter loves tea parties and these would go perfect with it! The Love Bug T-Shirt from Teesies is adorable! My daughter is always giving kisses and hugs so this would be perfect for our lil love bug! Bibu: I think these are sooo adorable! Rainbow Brite Bib Vintage Smurf Fabric Bib and the Smurfette and Bashful Smurf Bib….i wish there was adult tees with these images! Too cool! Such an awesome idea-Upcycled Tee Onesie: Dodgers Upcycled t-shrit Kellogs Fruit Loops Onesie! These are sooo cute! I *love* What Would Elmo Do on Teesies! From Peapods Cookies, I like the Alice in Wonderland Tea Party Decorated Cookies. From Teesies, I like the Satin Dress-Up Crown! From Breelzebub, I like the vintage key necklace, grey sueded cord, boho. From bibu, I like the Peanuts Bib: Vintage Charlie Brown and Linus. From tumblewee, I like the Celia’s Mary Janes: in Vintage Purple Flowers. The mini luggage cookies look delicious. Thanks for the chance. I like the kiss me onesie. I like the vintage skeleton key necklace. I like the pac man bib. I like the NYPD onesie. I love the iPhone app cookies and the princess cookies from Peapods cookies. At Teesies I love the Keep Calm and Feed Me baby bodysuit! At Breelzebub I love the unisex octopus photo locket necklace! At Bibu I love the Star Wars bib – Vintage Lando Calrissian! At Tumblewee I love the NYPD onesie!! At Peapods I love the Baby Zoo Animals Decorated cookies!! I liked the social media addict cookies haha. very cute. the KISS Me Baby Bodysuit from Teesies is adorable! the original dynamic marker drawing, professionally matted and framed from Breezelbub is awesome! Rainbow Brite Bib (12-24 month baby sized) is to cute! love! the Upcycled Black Tee Onesie: The Beatles from Tumblewee! I love Pea Pods Cookies’ custom Elmo cookies with the polka dots for a child’s second birthday party. My favorite item at Breelzebub is the selection of vintage farm matryoshka (nesting dolls). How adorable! Happy Birthday Jax! FYI, my Hugh Fielding pants arrived (thank you!) and they fit around the girth but they’re going to have to be used as capri’s! I love these cookies as we call ourselves “The Zoo”. My kids LOVE elmo! these are totally my style! adorable! people are so creative! my daughter has tons of shoes (my son’s the one who needs them) but too bac because these are the cutest! I absolutely love the Decorated Cupcake cookies at Peapods! I love the Vintage Farm Matryoshka at Breezebub! I love the Rainbow Brite bib at Bibu! I had a Rainbow Brite doll! I like the Celias Mary Jane’s in Vintage Purple Flowers at Tumblewee! I like the “my parents enjoy British humor” on Teesies – because it is soooo true! I really enjoyed everything on Bibu, but my favorites were the Papa Smuf bib and the Rainbow Brite bib. I would love the Decorated Tiara/Crown Cookies. I like the Love Bug T-Shirt from teesies. From Peapods by peapodscookies I also love the Pooh and Piglet cookies. 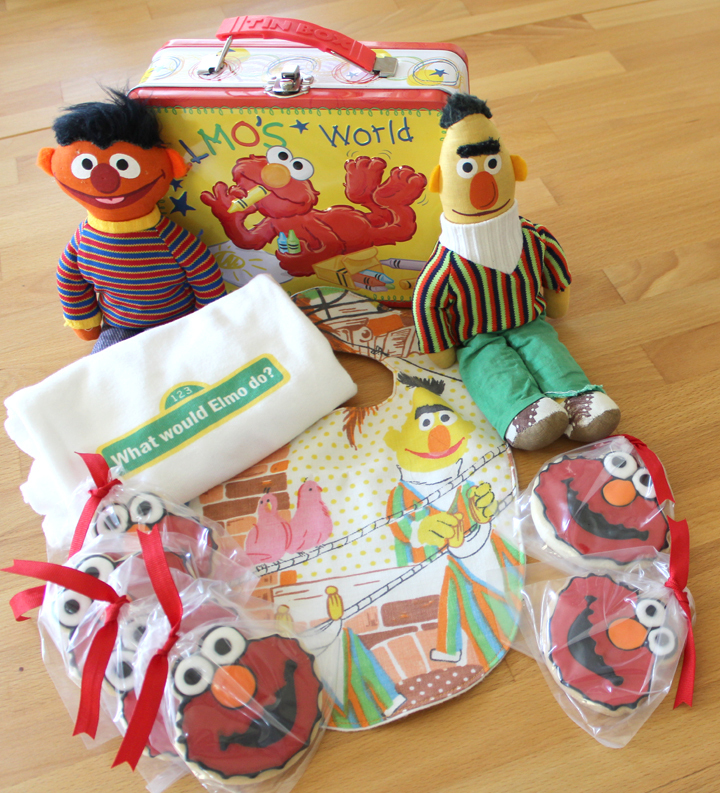 Oh my favorite from Peapods Cookies is of course…haha….the Decorated Elmo Cookies! From Bibu my daughter loves the Sesame Street Vintage Ernie fabric bib. My favorite item at Breelzebub is the original dynamic marker drawing! My favorite item from Bibu is the Sesame Street Bib: Vintage Grover and Oscar! Cute! Oh my favorite item from Tumblewee is the Upcycled Tee Onesie: xbox 360! krisj_27@hotmail.com I LOVE From Peapods Cookies, I LOVE the Alice in Wonderland Tea Party Decorated Cookies. They are so adorable! I would love to have some of the Decorated Elmo Cookies with numbers and stars, my son will be turning 2 soon! i like the i recycle tshirt!!! very cute!!! TV Test Pattern Throw Pillow on Bibu brings back memories!!! My favorite item from Peapods Cookies is the Neon and Bright Colors- Tea Party Decorated Cookies- Teapots, cupcakes, teacups and flowers. My favorite item from Teesies is the Hi, I’m New Here w/Flower Baby Bodysuit. on tumblewee i have to go with Upcycled Tee Onesie: NBA Boston Celtics since we’re big celtics fans!!! Congratulations! 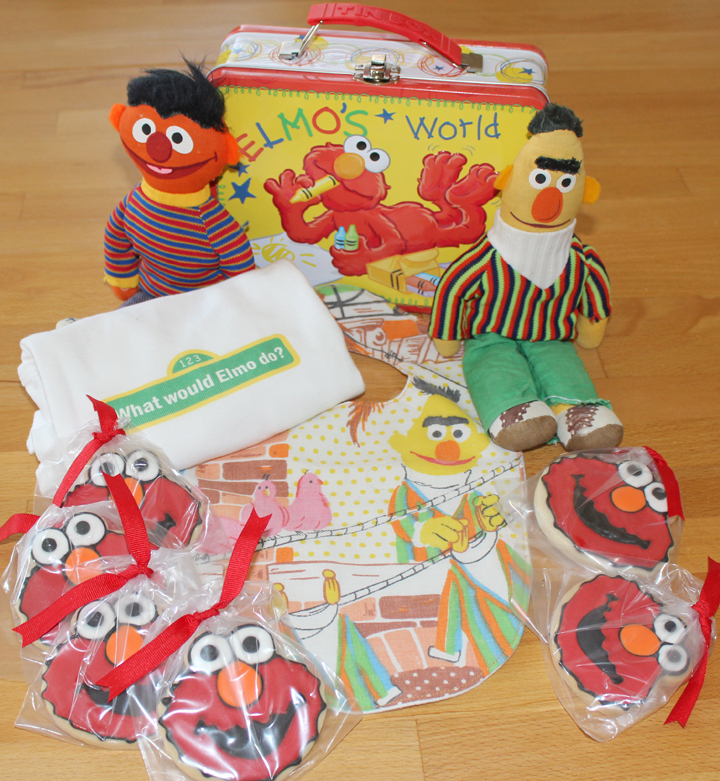 You’re the winner of our Vintage Sesame Street Baby Basket! Please send the mailing address to tumblewee at tumblewee dot com where you want the gift sent. My favorite item from Breelzebub is the industrial washer hoop earrings, made from metal washer hardware, silver tone, fish hook back. My favorite item from Tumblewee is Upcycled t-shrit Kellogs Fruit Loops Onesie. I love the cupcake cookies from Peapods! I love the bacon and eggs onesies from Teesies. Perfect for my twin boys! I love the industrial washer necklace from Breelzebub! I love the Rainbow Bright bib from Bibu! I love the upcycled tee retro superman onesie from Tumblewee! I follow Tumblewee on twitter @AMLewis2003. The Hello Kitty cookies are adorable! I like the Keep Calm and Feed me onsie from Teesies! Love the Hello Kitty birthday cookies! What a cute etsy shop! Bebu’s peanuts bib is adorable! i love the bright/neon colored tea party cookies! from Teesies I love the ‘baby buckaroo’ bodysuit! from Tumblewee i love the upcycled fruit loops onesie! I love the Elmo cookies! Teesies Keep Calm and Feed Me Baby Bodysuit! 12 months! Thanks! I like Emma’s Mary Janes: in Vintage Yellow & Blue at Tumblewee! fav from peapods are the circle baby faces! fav at teesies is the moneky see monkey do shirt. I love Peapods cookies Happy Birthday Hello Kitty Decorated Cookies- edible greeting cards. I like Teesies Psychiatric Help 5 Cents tote bag. I like Bizzlebubs 1948 Anthology of Children’s Literature. I lie Bibu’s TV Test Pattern Throw Pillow (Pillowcase only). I like Tumblewee’s Upcycled Tee Onesie: Hershey’s Brown Tee. 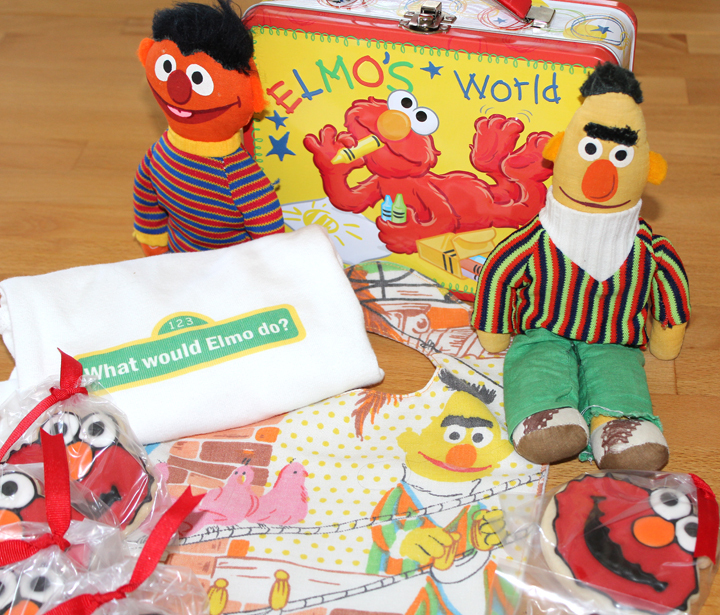 http://t.co/KoHUt6uw follow this link to enter to win a vintage Sesame Street prize pack very cool. By Tumblewee's blog. From Peapods Cookies, I love the Decorated Tiara/Crown Cookies. From Teesies, I like the Bacon and Eggs Baby Bodysuits. From Breelzebub, I like the 1992 stuffed baby elephant. From Bibu, I like the Rainbow Brite Bib. My favorite is the pink baptism cookies. Liked tumblewee on facebook. Linda Swap-Shopping Bradshaw. my email : teachinmomma123abc @ yahoo.com when i signed up for blog. I put teachinmomma123 without the abc above. Sorry. I love tumblewees Celia’s Mary Janes in Vintage Purple Flowers! I have a little girl 9 mo old and they’d look adorable on her!! I love peapods hello kitty cookies! we love hello kitty here! My favorite Tumblewee item is my custom Eagles Of Death Metal onesie. I can pretty much guarantee that my kid will be the only one on the block with this gem. You ladies are wawesome (both wow & awesome)! Joseph – thanks for the kind words and all the support! We appreciate it. The Pac Man Bib: Vintage Fabric from Bibu is so cute! I love Peapods tea party cookies! So beautiful and detailed! Love the Keep Calm and Feed Me onesie from Teesies. On Bibu, I love the patchwork baby blanket! So cute! On Tumblewee I like the hershey’s chocolate upcycled onesie.